A convenient way to store photos, negatives and slides in an attractive leather like 1.5" locking post binder. 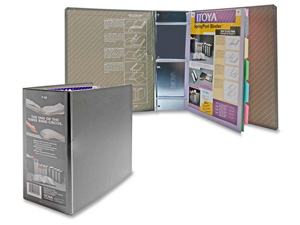 This Itoya Spring Post Binder is a convenient way to store photos, negatives and slides. Pages load and unload by simply pressing the metal release bar and sliding out the connecting post bar. The book-like binding saves space and pages lie flat when spring post is activated. Binders are durable and attractive in black leather with a pocket on the spine for identification purposes. Fits most standard size 3-hole punch print, negative, or slide pages up to 9-1/2 x 11-1/2. Dimensions: 9-3/4" x 11-5/8" x 2-1/2"